That is the question I'm posing to you guys! 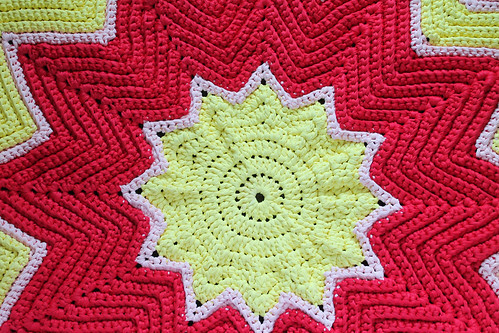 I can't decide whether or not to sew on the flower that is in the vintage rug pattern! I like the rug both ways... Do you think the sewn on flower would be a tripping hazard? Does it look like the flower is needed? Does it look better with the simple yellow center? Could you guys help me? Pretty please?! And I hope you have a great weekend my friends!! beautiful in both ways!! But if I'm forced to decide : with the flower!!!! With! But sew it down hard so there are no sticky uppy bits! 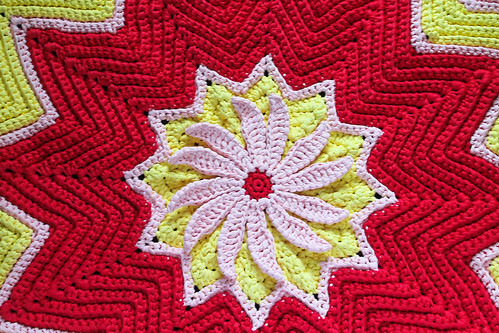 Gorgeous rug, with or without the flower. Thanks for the input! And good point about the sewing! I think the flower is very cute, but possibly inappropriate for walking on if your rug is truly destined for the floor! Thanks so much for your input!! Greatly appreciated! Well now, I think the flower looks fantastic! To avoid a tripping hazard, or the petals curling up, maybe you could sew along the petals of the flower in the centre of the rug? I think that flower really adds impact and finishes off the rug in a gorgeous way! I really like the flower, but since this a rug, I don't think I would put it on, for me I am sure it would be a tripping hazard and my dog would probably think it is something to nibble on! I love the rug! Thank you for your input!! I hadn't thought of what a pet might do to it! haha!! Thanks so much for the input!! Greatly appreciated!!! I say without, bigger impact! Thanks for the input, I'm so glad people have chipped in their opinions! It looks great both ways, but I really like the flower. hm, i like the simple version! I think the flower is the perfect touch! I am new to your blog and I think it is really great. Thank you so much!! So nice to meet you NeeNee, and thanks for the input!! With! The flower is a really nice finishing touch to this awesome project. Thank you so much for your input, it's greatly appreciated!! I love the flower! I would definitely add it if it were me.